We have a party to go to this week at our local General Consul's house after Trick or Treating. They've invited all Americans in Strasbourg to a Halloween party and asked everyone to bring a finger food to share. I'm terrible at this! I hate potlucks. I can whip up a meal for everyone at home that looks and tastes great, but everything I make for potlucks wilts, melts, or just tastes terrible. At potlucks for work, we're always assigned a course by last name (which rotates on a regular basis). I love getting dessert because although I'm not really a baker, I can make a mean batch of chocolate chip cookies or bake a simple sweet bread. But give me veggies, and I turn out sad-looking green beans. I've taken to bringing my dishes in throw-away containers so that I don't have to claim my uneaten dish at the end. But I never learn my lesson. I always want to experiment, push the envelope, so instead of falling on one of my standard dessert dishes, I decided to get fancy and try to make truffles. All of the recipes I read made it sound so easy. Except that I live in France, and the names of chocolates differ a little. So I made this recipe I found at Make Life Sweeter. I had seen versions of it in other places, and everyone seemed to be able to make them, so I thought I could too! Place the chocolate, butter and honey in a heat-proof bowl. Heat the cream with the orange until just simmering. Let it steep for 30 minutes. Strain through a fine meshed sieve into a measuring cup. Press onto the orange with the back of a spoon to get more flavour out of it. Fill up the measuring cup until you have 250 (1 cup) again. Reheat the cream. Pour the cream over the chocolate and allow to stand for a few minutes. Stir until smooth. Allow to come to room temperature for a several hours until firm enough to roll. Chill for some time if necessary. 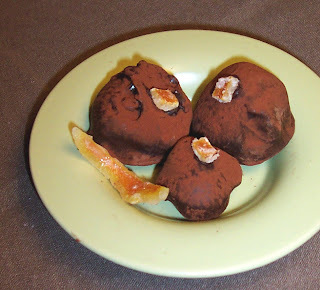 Put a piece of baking paper on your working surface to put the truffles on. Put the cocoa powder in a bowl. Scoop out balls with a melon baller. Roll between your hands to make a smoother ball. Place on the baking paper. Melt the chocolate au bain marie (or in the microwave). Allow it to cool down (if necessary) to 40°C (104°F). Place a ganache ball on a fork, submerge the ball in the chocolate. Use a spoon to cover the top with chocolate. Tap the fork a few times on the bowl and slide the bottom of the fork over the lip of the bowl to remove excess chocolate. Tip the truffle in the cocoa powder and use your hand to move it around covering it completely with cocoa powder. Place the truffle onto the baking paper. Repeat with all the truffles. I think I made two mistakes. 1) I used dark chocolate instead of "bittersweet" since I was crunched for time and I could only find dark chocolate in the local grocery store. 2) I added a little orange juice (just a tiny squeeze!) to the ganache because I wanted a more orangey flavor. The result? A not very firm ganache, even after refrigerating it overnight. My second problem was that the chocolate coating kept seizing up on me and turning into a dry mass of chocolate in the middle of dipping my little ganache balls. So, although they're edible (and I will be serving them to some college students coming over to our house for dessert tomorrow afternoon), and don't look half-bad, they are definitely not up to snuff for the General Consul's house. 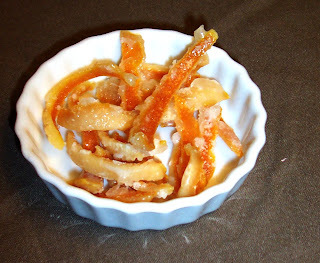 The upshot is that I learned how to make candied orange peel (which my two-year-old is now addicted to). I thought that it would look nice atop the lovely little truffles. It was a good idea in theory, when my truffles didn't look like little turds! I got this recipe from the Food Network, and it worked out great! Next time if you want more orange flavor, take turbuno sugar, grate orange zest, mix and roll them in it...Got citrus problems call the chef, lol, at least you tried. I made them for NY's Eve once and we had chocolate all over the house from people eating them all night! I love the combination of chocolate & orange. Your orange rinds look fabulous. Looks beautiful. I'm a chocolate and orange nut also, a great combination! i will have to try this recipe, thanks! Thẩm mỹ làm đẹp vùng kín đang là xu hướng của chị em phụ nữ hiện đại với nhiều dịch vụ đa dạng và mang lại hiệu quả cao giúp se khít, trẻ hóa vùng kín. Các dịch vụ tiêu biểu như trẻ hóa âm đạo, se khít âm đạo http://thammyamdao.com/phau-thuat-thu-hep-am-dao/ ; thẩm mỹ môi lớn, môi bé.